Bond fund or fixed income fund is essential for short- and long-term investor. Bond fund provides a regular income for investor to withstand volatile market. 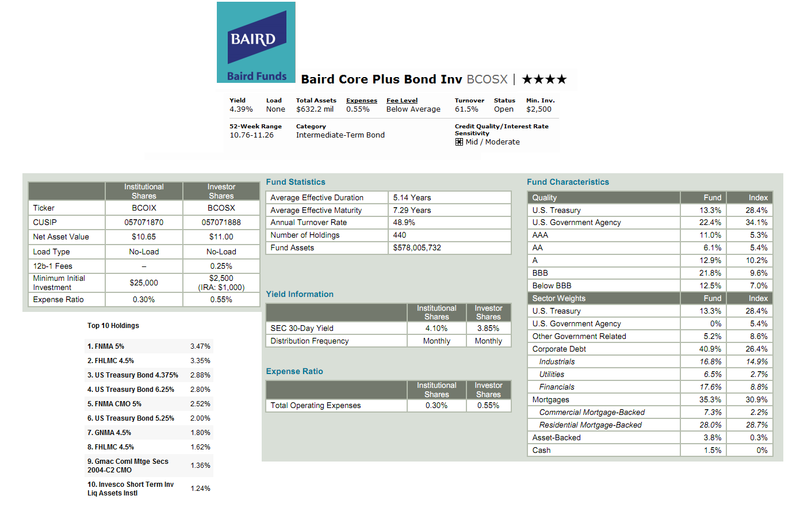 One of the best bond funds is Baird Core Plus Bond. You can use this bond fund to diversify your portfolio. The fund's review is described below. The Baird Core Plus Bond fund objective is to seek an annual rate of total return greater than the annual rate of total return of the Barclays Capital U.S. Universal Bond Index. The fund typically invests >80% of assets in the following types of U.S. dollar-denominated debt securities such as: U.S. government, U.S. government agencies, asset-backed & mortgage-backed obligations of U.S. issuers, and corporate debt of U.S. & foreign issuers. It invests mainly in investment-grade debt securities, but can invest <20% of net assets in non-investment grade securities. Average quality for the fund is generally at least the third highest category of S&P or Moody's. This Baird fund has been managed by Mary Ellen Stanek since its inception in September 2000. Investor may invest in this intermediate term bond fund using brokerage account or retirement account (IRA, 401k). To invest in the brokerage account, investor will need $2,500 for the minimum initial investment and $1,000 for IRA account. For subsequent investment, investor only needs $100 or more to add any new funding to the account, for either brokerage or IRA account. The fund has an annual expense ratio of 0.55%. This expense fee is lower than the average expense fee in the Intermediate-Term Bond category which is 0.94%. The 12b1 fee is 0.25% which is included in the expense ratio. This top rated fund doesn’t have any front-end sales load. Investor can buy this BCOSX fund from 49 brokerages include Vanguard NTF, Dreyfus NTF, JP Morgan, TD Ameritrade Inc, Pershing Fund Center, Schwab Retail, Raymond James, etc. The other class of this best rated bond fund is only available in Institutional Class (Ticker: BCOIX). This fund has annual expense ratio of 0.30%. This best rated bond fund requests a minimum investment of $25,000. This BCOSX fund has performed in 9-years with positive return since its inception and only 1 negative return. The best 1-year total return was achieved in 2009 with 15.06% and the negative return was in 2008 with -2.07%. Morningstar has ranked this taxable bond fund with 4-star return rating. As of June 2011, this top bond fund has returned 6.67% last year based on the load adjusted return and 6.38% over the past decade. This BCOSX fund has 3.52% YTD return. As of June 2011, this Baird Core Plus Bond Fund has a total of 440 holdings. The top 5 sectors weightings are Corporate Debt (40.9%), Mortgages (35.3%), US Treasury (13.3%), Other Government Related (5.2%), Asset-Backed (3.8%) and Cash (1.5%).